James Woodrow Mullenax, age 81, of Ranson, WV and formerly of Petersburg, WV passed away on Monday, October 16, 2017 at the Veterans Medical Center in Martinsburg, WV. Mr. Mullenax was born August 4, 1936 in Whitmer, WV and was a son of the late David Mullenax and Edna (McDaniels) Mullenax. In addition to his parents, he was preceded in death by one son, Michael Todd Mullenax; one brother, Floyd Mullenax and one sister, Rose Kepner. 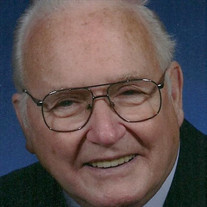 Mr. Mullenax graduated from Harman High School in 1955. He served in the United States Army. He retired from the Federal Government after 28 years of service. He formerly was a partime employee for Food Lion in Moorefield, WV. He attended the Charles Town Baptist Church in Charles Town, WV. Mr. Mullenax is survived by his wife of 56 years, Margaret J. (Smith) Mullenax; one son, James Patrick Mullenax and wife Karen of Palmyra, NJ; two granddaughters, Michelle Diroll and husband Nico of Bischburg, Germany and Jessica Steinert and husband Henry of Bamburg, Germany; one great grandson, Johann Steinert; four brothers, Donald Mullenax and wife Trish of Whitmer, WV., William "Sam" Mullenax of Whitmer, WV, Michael Mullenax and wife Lora Mae of Job, WV and Paul Mullenax of Mount Rose, WV; three sisters, Betty Collins of Davis, WV, Carolyn Turner and husband Clarence of Whitmer, WV and Elizabeth "Suzie" Reed and husband Roger of Beverly, WV; sister-in-law, Eleanor Painter of Maysville, WV; and numerous nieces and nephews. Family will receive friends on Friday, October 20, 2017 from 6:00 - 8:00 PM at the Schaeffer Funeral Home in Petersburg. Funeral service will be on Saturday at 1:00 PM at the Schaeffer Funeral Home Chapel with Rev. Dr. Brian Hotaling and Pastor Lynn Durbin officiating. Interment will follow in the Lahmansville Cemetery with Military Rites by the Potomac Highlands VFW Post 6454 and West Virginia Honor Guard. Memorial contributions may be made to Charles Town Baptist Church, Our Walk of Faith, 222 South Mildred Street, Charles Town, WV 25414 or Charity of Choice.